I’ve spent the weekend cleaning the house and working on a few projects, including one that I started last night and finished this afternoon. I’ll post about it at the end of the week. In the meantime, here’s a picture I came across in one of my photo albums. I’m around 6 years old. 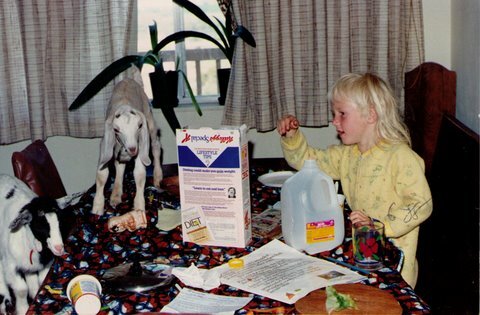 And no, I don’t know exactly why there are goats on the breakfast table. November 15, 2009. Tags: childhood pictures, goats. Pictures. 3 comments.